An athletic star in Gary, Indiana, Stram earned four letters in baseball and three in football at Purdue University. Immediately upon graduation, he began his coaching career, as an assistant on the college level at Purdue, Southern Methodist, Notre Dame and Miami (Florida). In 1960, he was named head coach of the Dallas Texans in the new American Football League and guided the Texans to the 1962 championship. 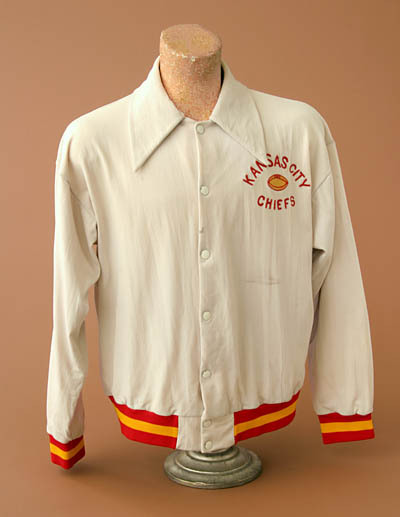 He followed the team to Kansas City when it became the Chiefs in the NFL. The Chiefs lost to Green Bay in Super Bowl I in 1966, but four years later defeated Minnesota for the Super Bowl title. In 17 years of pro coaching, his record was 131-97-10. Stram became a popular radio and television football analyst. He was elected to the Pro Football Hall of Fame in 2003. Hank Stram’s path to football greatness began many years ago when he was an athletic standout at Wallace High School in Gary, Indiana earning All-State honors at halfback. He also starred in basketball, baseball and track. After graduation, he attended Purdue University on a football scholarship. He earned four letters in baseball and three in football for the Boilermakers. His collegiate career was interrupted for three years of military service in World War II. In his senior year at Purdue, Stram received the coveted Big Ten Medal that is awarded to the conference athlete who best combines athletics with academics. Immediately upon graduation in 1948, Stram joined Purdue’s football coaching staff. He served 12 years as an assistant on the collegiate level, with stops at Southern Methodist, Notre Dame and Miami (Florida). In 1960 he was named head coach of the Dallas Texans in the new American Football League. The rest is history. Stram guided the Texans to the AFL championship in 1962 and the team then moved to Kansas City and became the Chiefs. In Kansas City, Stram led the Chiefs to the 1966 and 1969 AFL Championships. His 1966 Kansas City team played in the first Super Bowl, losing to the Green Bay Packers. The highlight of Stram’s illustrious coaching career came on Jan. 11, 1970, when the Chiefs defeated the Minnesota Vikings, 23-7, in Super Bowl IV. He also led the Chiefs to playoff appearances in ’68 and ’71. Stram coached 17 years in professional football and had a career won-lost-tied record of 136-100-10. His victory total is eleventh on the all-time NFL coaches list. He finished his career with two seasons (1976 and 1977) as head coach of the New Orleans Saints. An innovative coach, Stram is credited with devising the two tight end offense, the stack defense and the tight end I formation. He also developed the moving pocket to utilize the talents of his quarterback with the Chiefs, Len Dawson. 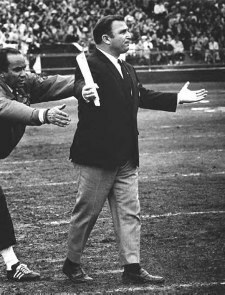 In August, 2003, Coach Hank Stram received the ultimate honor with his induction into the Pro Football Hall of Fame in Canton, Ohio. For many years, Stram has provided expert commentary for pro football games for CBS radio. Hank Stram died on July 4, 2005 at the age of 82.